Lately I read an article about how healthy avocado is, so I decided to include it into our diet. I didn’t know that avocado ripens after harvesting. I knew it is healthy but the article provided some numbers like about 75% calories comes from fat that is good cos its the monounsaturated fat. Avocado also contains potassium, are rich in vitamins B, and vitamin E and K. Since we are trying to eat healthy, and diet, that means avocado should be eaten more often in the Mullen Household. 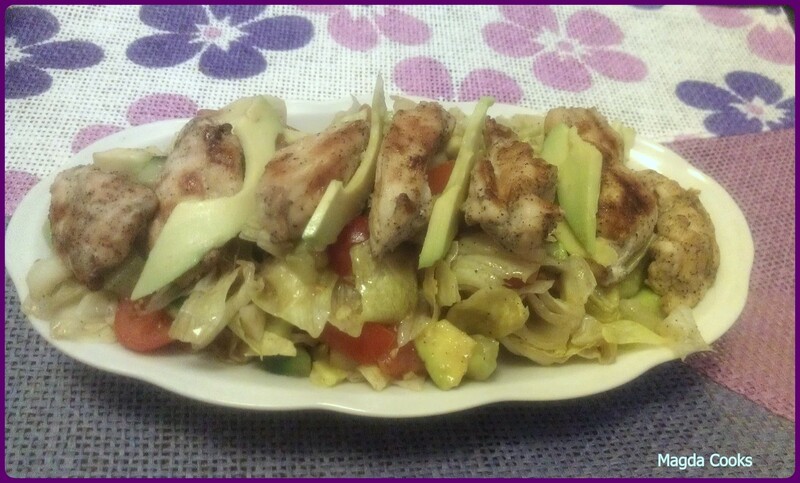 I was looking for some recipes with avocado, and found couple good ones, and decided for a salad that I tweaked with some grilled chicken to serve as a dinner one evening. If you don’t have some leftover chicken, grill it in pieces, it will be easier to serve. Cut avocado in cubes, sprinkle right away with lemon, cos other way it will darken. Leave few slices for decoration. Cut tomatoes, and pepper in cubes, iceberg into bite size pieces. Mix all ingredients in a bowl. To the jar with a tight lid pour oil and vinegar, spice with salt, pepper and sugar. Cover tightly, and shake to mix ingredients. Arrange salad on the plate, put pieces of chicken on top and decor with slices of avocado. Can be served with a baguette or just without anything if you prefer.